Counting down until the end of October ... 9 days left until end of Inktober. Today's picture/drawing is on the anti-knife ROE (rules of engagement) taught by Lee Morrison of Urban Combatives. My transcription of the caption as well as some notes below. 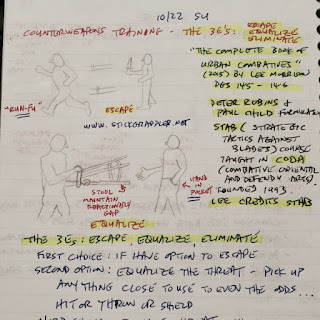 Peter Robins and Paul Child formulated the STAB (Strategic Tactics Against Blade) course taught in CODA (Combative Oriental and Defendu Arts). Lee Morrison credits STAB for most of the knifefighting and counterweapons training he teaches in UC (Urban Combatives). First choice: If you have the option to Escape, do so. Second option: Equalize the threat - pick up anything close to use to even the odds ... hit, throw or shield with the equalizer. Third choice: Eliminate threat - shift into do-or-die mindset. My drawing doesn't include "Eliminate" - that may be a future drawing/picture, but basically you do what you have trained in for the third "E". 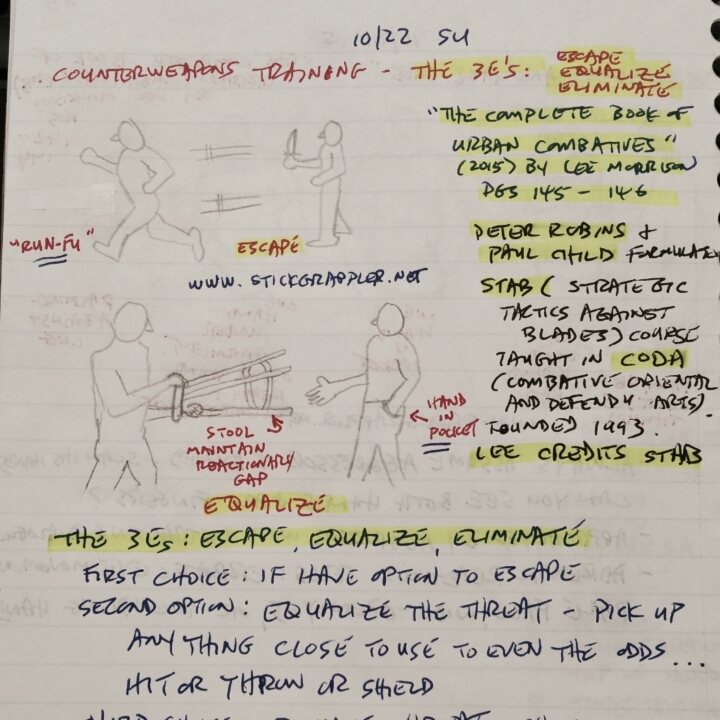 IMO, STAB's The Three Es is an easy concise way to remember Dan Inosanto's anti-knife ROE. You now have a set of ROE to work under. Now you know, and knowing is half the battle!! Be aware and stay safe my Friends!